New Team, Players, Coaches, Volunteers Wanted! Cornwall Women's Cup - CCFA help? Trevor Mewton - RIP - truly a legend! 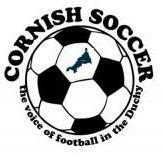 Cornwall Senior & Junior Cup Draws.- Latest.